We’re in the Arafura Sea and we are beginning to experience the problem with leaving Darwin. Where are the NW’ers and the Westerlies? It’s all Easterlies, on the nose against us, so are the currents. Sometimes there is no progress at all even while motorsailing, and no where to anchor. What do you do? We want to go East, the wind and current only let us go either North or South. That is a 180˚ tacking angle. So we aim Ashiki North, after two hours, say, she starts sailing a few degrees towards East, eventually she’s heading North East, not bad. The current is slowing changing and letting us make some Easting. Tack around and she can make South East for a couple hours, then the current starts moving against us and Ashiki is heading more Southerly. I find sailing her with the tiller lashed is best, this will let Ashiki follow the wind if there is any change in direction. TP can't anticipate this and wants keep Ashiki pointing on a compass course. She inscribes these weird rounded Z shapes across the chart plotter, its the pattern of the changing currents letting her do what she can. But wind is on the nose and we are tacking day in day out, making good only 30 miles/day. It will take two weeks to get to Gove at this rate! We are spending large amounts of time at 1 to 2 knots. 2.5 knots is a good speed! We had one memorable afternoon when the winds swung from the NE, strengthened and Ashiki can make direct East, romping along at 4.5 to 4.8 knots. I was thinking she had forgotten how to go that quick.. 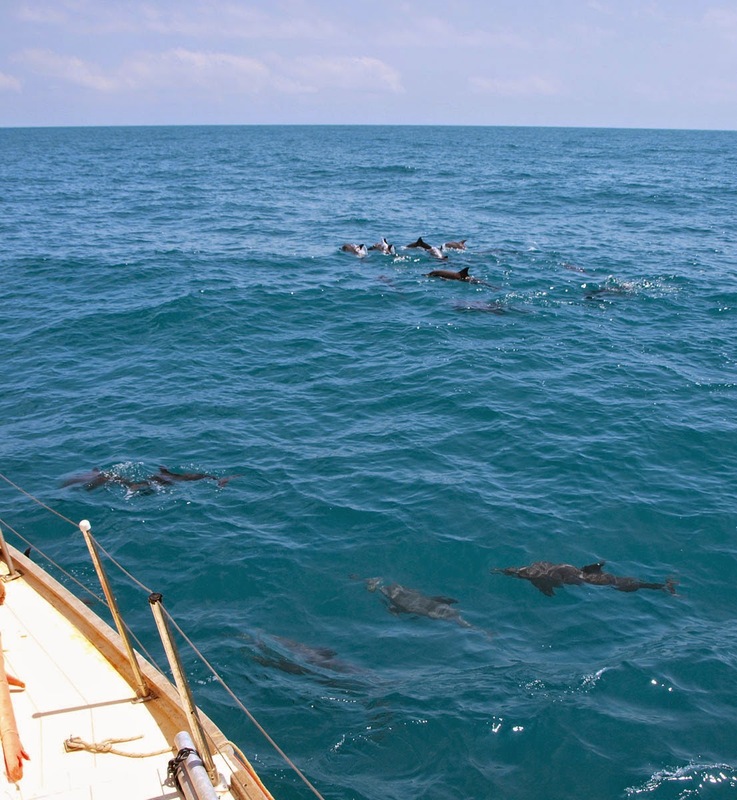 So quick a big pod of dolphins joined us, cavorting over each other to sit on our bow wave. Later that night its back to Easterlies. I prefer the calms at least we can motor straight east, making good 2 to 3 knots (instead of the normal 1 knot made good tacking). dolphins. None of them over 1.5m (4ft). twice the size of these. Another night its blowing a gale, at least 35 knots. I’m thinking we could make 3 or 4 knots SE into this, but the Crocodile Islands are only a few miles away so the decision was made to reef down and head North. At least we could sleep and not worry about land. After the storm abated we tacked and headed South again, back on exactly the same track the night before, we ended up making zero progress in 12 hours. Good thing we always keep a large stock of food on board, at least 3 months supply and 6 weeks of fresh water, because two weeks were up and we still had 56 miles to go. We’ve read in the old time cruising books about crews on small sailing boats taking a month or two to cross oceans end up dreaming of the meals they’re going to eat when they finally reach port. We’re were already at that stage! I was thinking lamb cutlets and sausages at that point..
We made the Wessel Islands, our first anchorage in 10 days, further south in that chain than we wanted, but we’re there! It took us most the next day to get back up along the island to the “Hole in the Wall”, the gap in the islands we needed to pass to continue on to Gove. It’s a fun little gap and we’re looking forward to it. 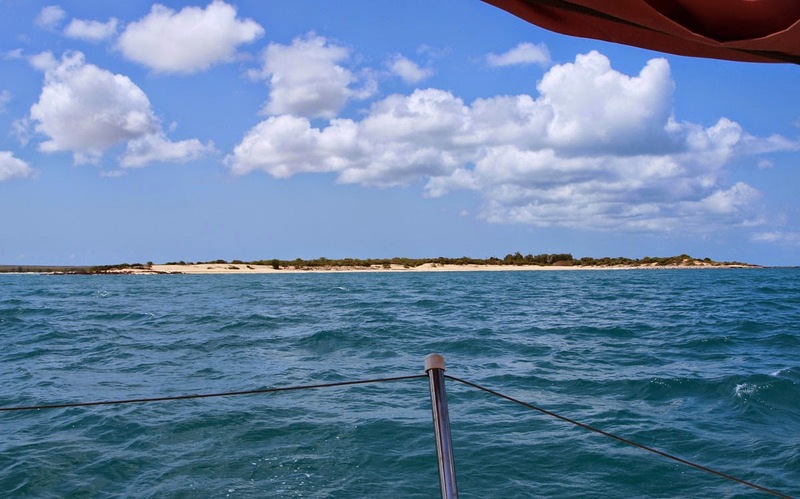 Time the tides right and you're sailing through it at 10 knots. Of course, we don’t have any tide tables so we’ll have to wing it. We arrived at the entrance and proceeded to sail through, it looked ok. About 300m from it we are starting to go backwards…. yeah, not the right time, fortunately the bay back from the entrance is quite protected and we anchor there for a few hours. We try again and get a few hundred metres inside the narrow channel, I swear the current looked right, Susie was completely skeptical saying its all wrong. Well, Susie was right, we failed again. Hmm, we sail back to the bay and settle in the for the night and missed the radio transmission from that pesky Custom/Border Protection plane that flew low over us. In the morning I woke to see another yacht had anchored in the bay the other side of the point. I suggested to Susie we’ll follow them through, they are surely more organised than us and know the tides. Sure enough this boat weighed anchor and made its way to the Hole in the Wall at 8:30am. It was big modern plastic beast, an Oceanis 47 and they seemed to picked the right time as we watched them progress through without getting blown backwards. So we up anchor and head on after them. As we get closer Ashiki is going faster and faster, by the middle of the channel I see 9.9 knots on the GPS. A gust comes, Ashiki heals over violently and heads for the rocky shore! Susie quickly drops the foresail and boat gets back under control. I think main only is best in these circumstances. In a few minutes we are through the other side, the course for the straits between the next set of islands is more Southerly and for once the Easterly is favourable! First favourable winds in almost two weeks! We raise all panels and Ashiki is averaging 4 knots. The big Oceanis in the distance slowly pulls away from us, that’s the difference more waterline makes. Looking back, the Hole in the Wall. Good thing is those people on the other boat obviously did their homework because we need the current to be with us for the next two straits we have to shoot. The next, “The English Company Islands” is 16 miles away, another “Point William” is 5 mile after that and the tide changes in 6 hours. It’s a good thing Ashiki is sailing fast today because we made both straits within the allotted time and shoot through both at 5 to 6 knots. After the 1st strait Ashiki is surging along beautifully at 4+ knots when I see another large yacht behind us and making ground on us fast, I actually hauled up the last panel on the foresail to give Ashiki more drive and we’re making 4.8 to 5 knots to windward, they gradually pass us, looking to be holding 6 to 7 knots, an R45. A good 15 foot longer waterline than us. R45 racing past.. and I thought we were going great guns..
That last strait cleared and its only 21 miles to Gove, Ashiki is holding over 4 knots, a day we never experienced in the previous 2 weeks, apart from that 4 hour session with the dolphins. In the distance Gove looked like a city of high rises. There aren’t any high rises in Gove, the refraction on the sea made the smoke stacks of the bauxite refinery look taller. But it did make Gove look kind of prosperous and inviting. We were anchoring off the Gove Sailing Club by 8pm that evening. Later we met the couple on the Oceanis 47, from NZ, they had bought the boat in Croatia having never sailed before. That was eight years previous. I thanked them for showing us the way through the Hole in the Wall, they obviously had their act together with tide tables and timed it beautifully. 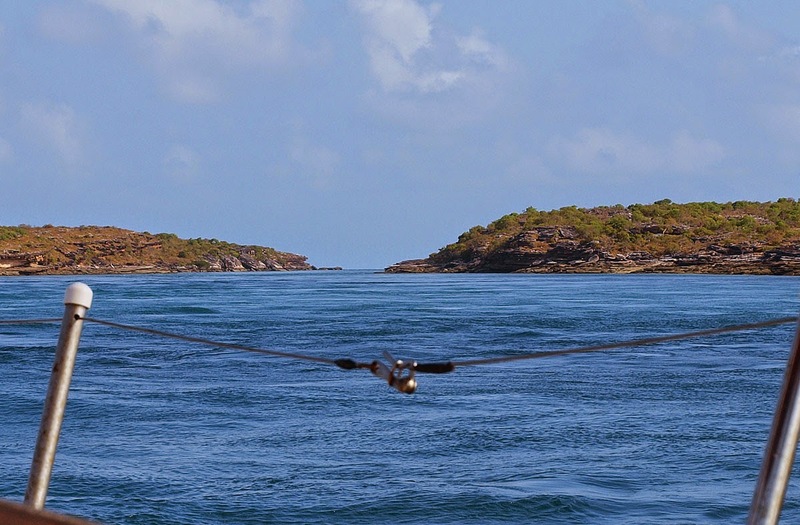 The skipper said “We don’t have tide tables either, we were winging it…”. But its interesting to hear them say they go “slow” everywhere, 3,4 and 5 knots (most yachties tend to overstate their speeds but not these guys). I thought the mighty Oceanis would be quicker than that. In comparison, up here in the tropics I would say Ashiki goes everywhere at 2,3 and 4 knots and the shorter WL amounts to roughly 1 knot lower hull speed. 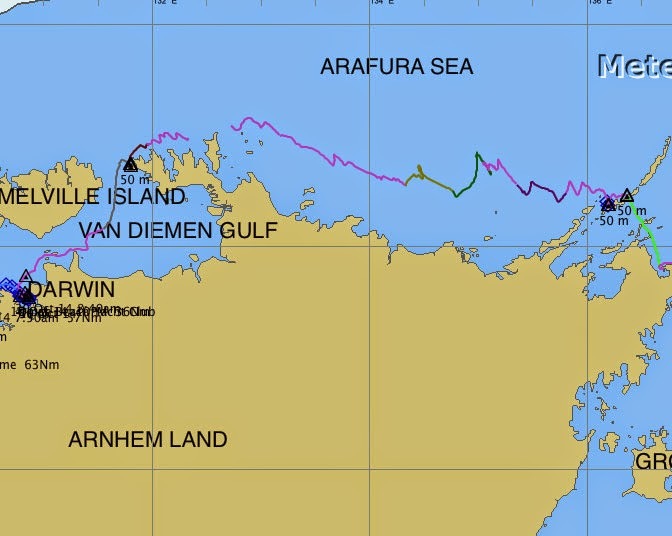 It took us 15 days Darwin to Gove, that is 28 miles/day made good. Really slow, but that’s the reality of sailing with wind on the nose. Put it another way, Ashiki sailed over 700 miles to cover the 420 miles. We motorsailed over 50 hours too, can’t say how much time that saved us, it could be 2 days or a week, it may have got us over a patch which might have taken days if sail only. 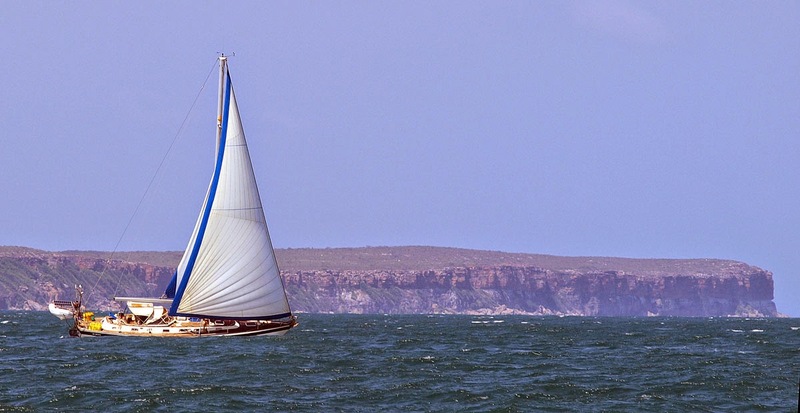 There were several cruising boats in Gove which had just made the same voyage, they mostly took 5 or 6 days. They tended to motor 5 knots straight into the wind the whole way. We can’t do that. They’d run a fuel budget of a several thousand dollars too (including getting down some of the QLD coast). Something we don’t do either. 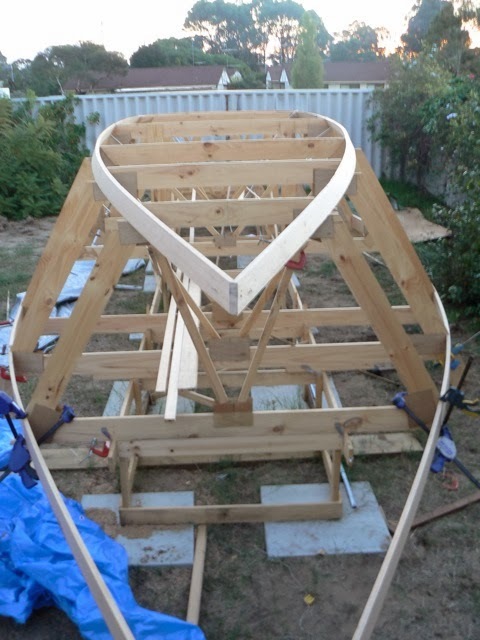 I think we’re happy the way we do it, Ashiki is a sail boat after all.